(Nov. 15, 2016) Crash data helps PBOT decide where and how to invest in safety. But the time between when a crash happens and when the data reach PBOT’s Vision Zero team for analysis can take months. Reducing that delay, and gathering better data on the role of speed, impairment and distraction in crashes, are key pieces of Portland’s draft Vision Zero Action Plan. 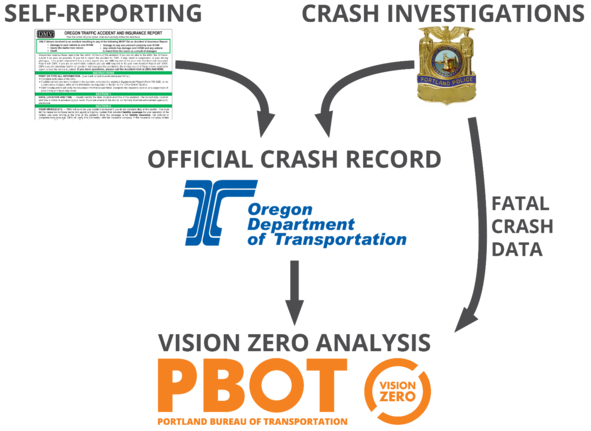 Other data-related actions call on PBOT to crosscheck crash data with trauma data to identify discrepancies, and to review crash and equity data regularly with Portland Police. “Vision Zero is data-driven and has a fast timeline, which means we need to have the best data possible, as quickly as possible, guiding our investments,” says Clay Veka, PBOT’s Vision Zero Project Manager. Before getting to PBOT, crash data touches as many as four groups: the public, the DMV, Portland Police and the Oregon Department of Transportation (see figure). Most crash data is self-reported through the DMV. People in Oregon who are involved in a crash must submit a DMV form if that crash (1) involves a motor vehicle, and (2) results in an injury or at least $1,500 in property damage. Both self-reported and police data are sent to ODOT for analysis and reporting. ODOT makes the official crash record available to PBOT and the public about 10 months after the end of the year reported; for example, the agency released crash data for the year 2013 in November 2014. Under Vision Zero, PBOT will work with the DMV, Portland Police and ODOT to accelerate the release of data on crashes that result in deaths or serious injuries. Vision Zero also needs better data on the role of speed, impairment and distraction in serious crashes. Records from 2004 to 2013 show that speed and impairment were factors in 47 percent and 56 percent of Portland’s deadly crashes, respectively. Conversations with traffic investigators and safety experts suggest that the actual numbers are probably higher. Distracted driving is also likely underreported. Excluded entirely are crashes not involving motor vehicles, which includes incidents in which people biking crash on rail tracks. As Vision Zero moves forward, more timely and comprehensive crash data will help PBOT make smarter, quicker decisions about safety investments, says Veka, who adds that equity will also play a role.